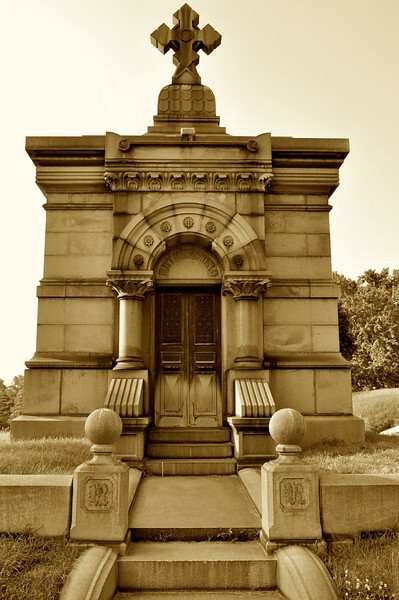 Rutherford Mausoleum at The Green-Wood Cemetery. These things fascinate me. They are houses of the dead, kind of like mini pyramids, indeed there is one in Green-Wood that is in fact a pyramid. There are hundreds of them through out this cemetery. Some of them are opened every generation to receive new residents and some have not been opened in generations. The attention to detail and the quality is mostly outstanding. But don't worry, I won't post photos of them all here! Nice in monotone. You would then love to photograph at Recoleta Cemetery in Buenos Aires, Argentina. I enjoyed reading your thoughts to go with the shot. Fascinating architecture and custom. Great comp and pp. They all scream money, but one thing that money can't buy is more time. Well composed................lots of shapes,lines, and textrues can be seen here!! !